E-Books, Kindles, Nooks, tablets, and iPhones have revolutionized the way we read and interact with literature. With thousands of titles becoming available in digital formats each day, it comes as no surprise that local libraries are seeking to add e-Books to their portfolio of services. Utilizing the Cloud Library of the MAIN consortium, the Mount Arlington Public Library, in collaboration with Digital Strategy Associates LLC (DSA), has embarked on an innovative campaign to engage patrons through their digital devices. Through the Cloud Library, patrons can download and borrow hundreds of e-Books straight onto their compatible devices. The Cloud Library is compatible with most popular e-Reading devices including the Kindle Fire, iPhones, iPads, Nook eReader’s, and Android devices. 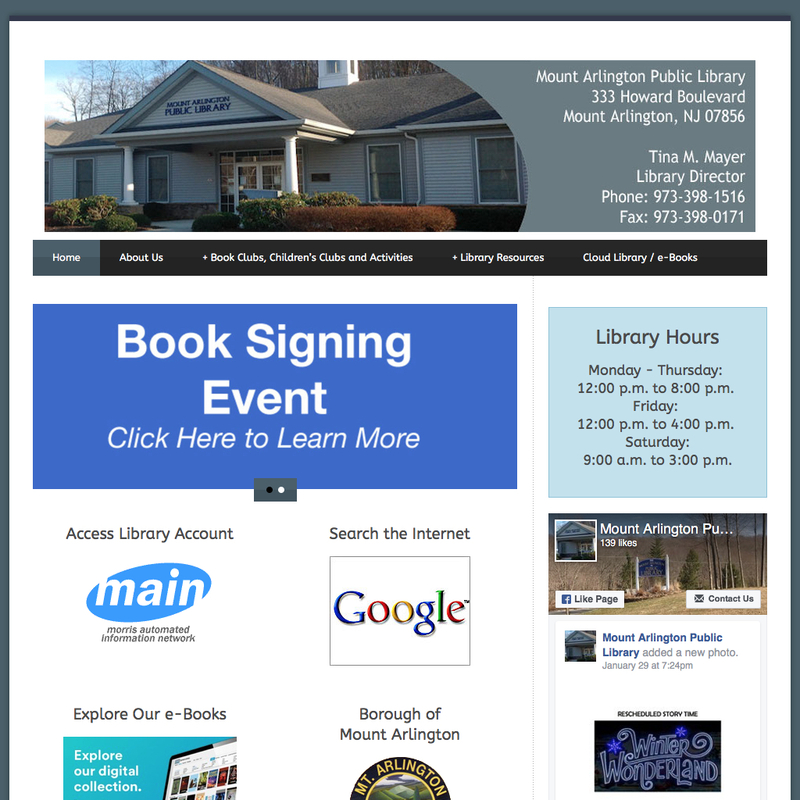 As the technology consultant’s for the Mount Arlington Public Library, Digital Strategy Associates assisted with the rollout of the e-book library service. DSA designed a comprehensive patron information campaign on multiple platforms, including traditional print brochures, social media outreach, as well as the library’s website, MountArlingtonLibrary.org. Additionally, DSA developed and implemented a staff training seminar to ensure that library personnel are well prepared to assist patrons with their e-Book related questions. Digital Strategy Associates collaborated with the library’s leadership to identify, develop, and implement a website design strategy that addresses their existing needs and future goals. The newly designed, responsive website, looks great across all devices and computers, including tablets and smartphones. With an easy to use content management system, staff can post news and announcements.